Smoked fish is often thought of as a luxury with a high price tag, but for the ancients who populated the northernmost regions of the world, smoking meat and fish was a lifeline for survival. 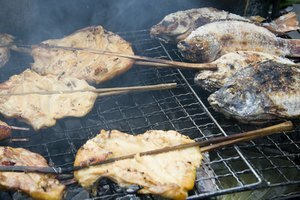 One of the oldest preservation methods, smoking has re-emerged as a grilling technique with the introduction of advanced outdoor grills and smoking bamboo baskets fired by dried grasses, not to mention the advent of home cooks wishing to cross the bridge into chefdom. Choose your fish carefully, though, because the success of the process depends principally on smoking the right fish. Fish found in cold lakes and seas are the best for smoking. 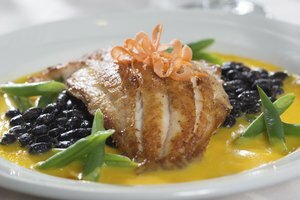 They contain the most fat, insulating the delicate meat and contributing to the natural flavor of the fish. Oily fish include mackerel, trout, salmon, sea bass, tuna, sailfish, sablefish, sturgeon, bluefish and mullet. The fat or oil content is what yields the prized flaky interior and crisp exterior when the fish is smoked. A staple in heart-healthy diets, wild coho salmon is also high in protein, B and D vitamins, magnesium and selenium. The fat in high-fat fish is the so-called good fat, containing high concentrations of omega-3 fatty acids. These acids are reported to lower the risk of heart disease, stroke and conditions affected by narrowing of the arteries. Smoking doesn't change the omega-3 composition of the fish, according to Dr. Marit Espe, a senior scientist with Norway's National Institute of Nutrition and Seafood Research. 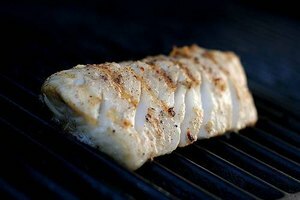 Smoking lean fish, such as cod, flounder or grouper, isn't ideal. The salting reduces the moisture content of the already-lean fish, resulting in a main dish that's salty to the taste, dried out and tough. The techniques for smoking fish involve high salt quantities and long smoking durations. 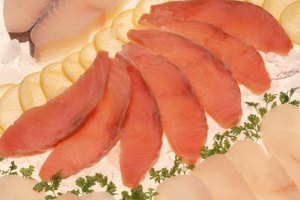 Although eating smoked fish is a good way to get omega-3 fatty acids, a byproduct of the smoking process is the creation of nitrates and nitrites, which may result in the development of a compound that's been shown to cause stomach cancer in lab animals. 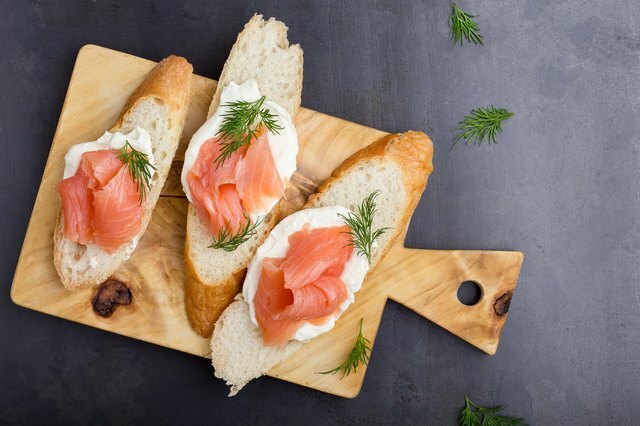 A 3-ounce serving of fresh salmon supplies approximately 51 milligrams of sodium, whereas a 3-ounce portion of smoked salmon may contain more than 660 milligrams of sodium, depending on the amount of salt used in the brine. To counteract the high salt content of smoked fish, add plenty of fresh fruits, vegetables and whole grains to the menu. Drinking plenty of water is also a must to rehydrate your body and offset the sodium you've consumed. Cold smoking is dangerous if you're not well schooled in the process, as the interior temperature of the fish doesn't rise high enough to eliminate all the bacteria that can lead to food poisoning. Because contamination can occur via the fish itself, the equipment used or the skill of the person doing the smoking, this method should be left to the professionals. Hot smoking is the safer of the two methods and with the right oily fish, the easiest and most rewarding. The brine is the first stop for uniformly cut pieces of fish. It’s made with 1 cup of Kosher or noniodized salt mixed with 7 cups of water, which is enough to brine 2 to 3 pounds of fish. To fully salt the fish, let it soak for one hour. After brining, rinse the fish and let it air-dry for about an hour. The flesh forms a shiny, sticky surface that protects it from spoiling and aids the smoking process. Hot smoking is a slow process that requires patience. For the first two hours, the fish is smoked at about 90 F. Then the heat is increased until the fish reaches an internal temperature of about 160 F and is cooked for at least half an hour longer. After the fish rests for about 30 minutes, it's ready to eat. If you're looking for a more intense taste, wrap the fish and put it in the refrigerator overnight. Letting the smoke permeate the fish in this manner gives it a truly smoky flavor. You don't need to eat your entire batch of hot-smoked fish in one sitting. Let the fish cool down to room temperature and then vacuum pack it or wrap it tightly in plastic wrap. Store it in a refrigerator at 38 F or less on the bottom shelf, the coolest spot in the refrigerator. The unopened fish will last for up to two weeks, with its smoky, rich character intact. Hot-smoked salmon is flaky, making it ideal to use as a topping. Spread the flakes over whole-wheat pasta or make mushroom risotto using pearl barley and crown the dish with lovely pink salmon flakes. Smoked trout’s delicate taste won’t overpower whatever you’re serving with it, which makes it ideal for salads and pasta. Oily smoked mackerel has a strong flavor that welcomes the addition of herbs, chiles or even horseradish. And of course, smoked salmon steaks are a perennial delicacy, especially when served with pickled cucumber salad and roasted heritage potatoes topped with a dollop of sour cream. Bon Appetit: What’s the Difference Between Hot-Smoked Salmon and Cold-Smoked? Food Safety News: How Safe Is Home-Smoked Salmon? Vital Record: News From Texas A&M University Health Science Center: You Asked: What Happens to Your Body When You Eat Too Much Salt?